(3) those of Vernon (1994: 710). We can see them below in the following graph. These are quite seriously divergent estimates and the question arises: who is right? There is an important question here about whether movements in the labour force – especially involving women – were pro-cyclical or countercyclical in the 19th century. If labour force participation rates were countercyclical in the sense of rising during recessions, then this added to unemployment rates, as women, young adults, and perhaps even children went out and looked for employment when their husband/fathers/breadwinners lost employment. If this assumption is correct, then Lebergott’s estimates may be better ones for unemployment rates. “Together with the results of the cross-section regression on city-wide labor force participation, this casts serious doubt on the plausibility of procyclical labor force behavior before 1914. These empirical results make sense from the historian’s perspective. In a period before social security and unemployment insurance, the notion of an added worker effect among secondary workers is surely more persuasive than a discouraged worker effect. Similarly, the absence of pronounced procyclicality in labor productivity fits the historical image of a labor market characterized by spot markets, with rapid turnover and limited adherence to internal labor markets.” (James and Thomas 2007: 39). “Before 1914, the labor market worked such that business cycle downturns spread unemployment over a larger share of the labor force; in the postwar period, recessions deepened the length of time out of work for the smaller proportion who lost their jobs. These results indicate that modern modes of labor market behavior were not typical of the pre-1914 US; by extension, it must be that the twentieth century has seen significant changes in the nature of the labor market. But they also carry implications for the debate over stabilization since 1948. In particular, they cast considerable doubt on Romer’s claims that the measured decline in unemployment volatility was a statistical artifact created by the procedures used to construct the historical series. 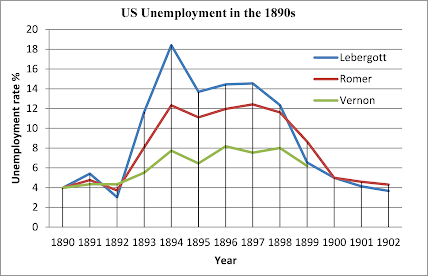 The assumption of a unitary elasticity of employment to output does not seem out of place for the period before 1914; if anything, the appearance of an added worker effect before 1914 suggests that Lebergott’s method of interpolating labor forces data between census benchmarks may have understated the degree of unemployment.” (James and Thomas 2007: 40–41). The upshot of all this is that Romer’s assumption of procyclical movements in labour force participation rates before 1914 appears unrealistic, and her figures are therefore unreliable. It seems to me that Vernon’s (1994) even lower estimates are also rendered unreliable by this, since Vernon assumes procyclical movements in labour force participation in the 19th century too, and simply adjusts Romer’s own unemployment data (Vernon 1994: 702, 709). 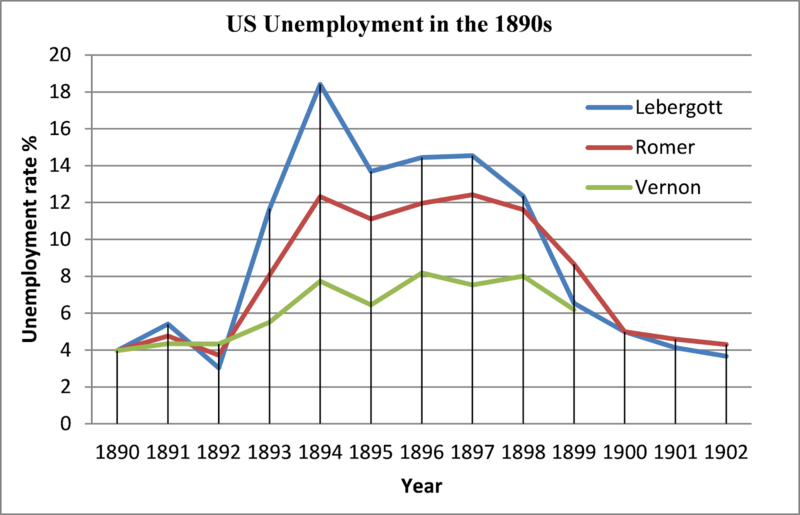 Despite the charge that Lebergott’s estimates of 1890s unemployment are based on limited data (namely, the Frickey employment index series covering industrial employment in Ohio and a number of northeastern states [Vernon 1994: 709]), nevertheless his figures may be more reliable than Romer’s or Vernon’s, and the 1890s – at least by this criterion – were a period of severe US unemployment and economic crisis comparable to the Great Depression. 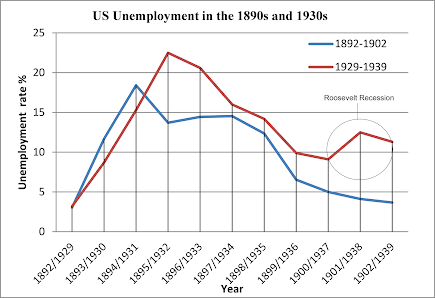 This can be seen below in the graph of US unemployment in both the 1890s and 1930s. First, we should ignore the Roosevelt recession of 1937–1938, because that was a policy-induced recession caused by austerity. 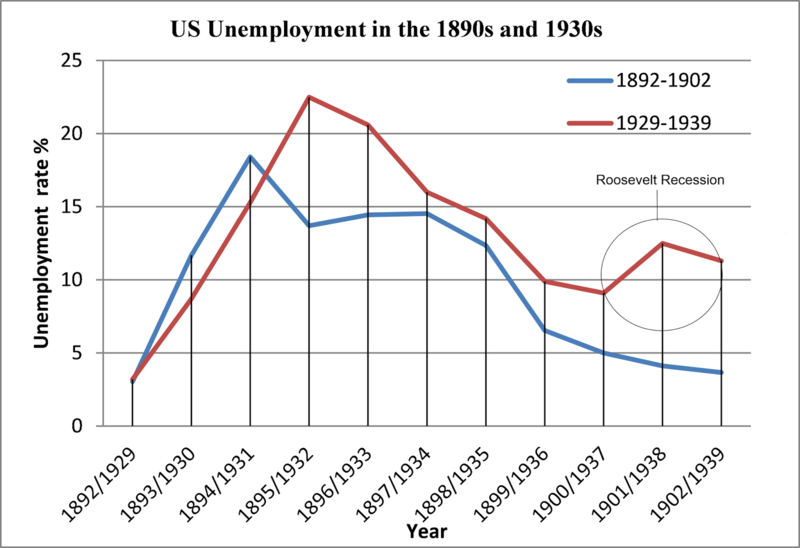 Although unemployment in the 1930s did rise to a higher level, nevertheless the 1890s shock was very bad indeed, and employment growth appears to have stagnated from 1895 to 1897 (under a double dip recession). But, at this comparable point in the 1930s, as measured from the onset of the depression, US unemployment was falling sharply under the New Deal. We can conclude that 19th-century capitalism under the gold standard was quite capable of delivering unemployment shocks comparable to the Great Depression, even if not quite as high, if we accept Lebergott’s estimates as reasonable. As an aside, this is also my 1000th post! James, J. A. and M. Thomas, 2007. “Romer Revisited: Long-Term Changes in the Cyclical Sensitivity of Unemployment,” Cliometrica 1.1: 19–44. Romer, C. D. 1986. “Spurious Volatility in Historical Unemployment Data,” Journal of Political Economy 94: 1–37. Weir, D. R. 1986. “The Reliability of Historical Macroeconomic Data for Comparing Cyclical Stability,” The Journal of Economic History 46.2: 353–365. Weir, D. R. 1992. “A Century of U.S. Unemployment, 1890–1990: Revised Estimates and Evidence for Stabilization,” Research in Economic History 14: 301–346. Below are links to various posts on 19th century economic history, in the US, the UK, Australia and Japan. Below are links to my posts on the nature, origin and history of money. “Bibliography on the Origins of Money,” January 19, 2012. “Endogenous Money: A Bibliography,” April 5, 2012. “Money is not a Neutral Veil,” June 30, 2010. “The Utility of Money in Post Keynesianism,” June 30, 2010. “Money: Is it Wealth?,” October 12, 2010. “F. H. Hahn in a Candid Moment on Neo-Walrasian Equilibrium,” January 29, 2011. “The Monetary Production Economy and Fiduciary Media,” December 11, 2011. “Keen versus Krugman: The Great Debate!,” April 4, 2012. “The Origin of Coinage in Ancient Greece,” April 29, 2011. “Alla Semenova on the Origins of Money,” January 15, 2012. “David Graeber on Debt and Money, Part 2,” February 9, 2012. “Alfred Mitchell Innes on the Credit Theory of Money,” March 24, 2012. “The Origin of Money in the Digest of Justinian,” August 21, 2012. “Debate on the Origin of Money,” August 25, 2012. My most detailed and recent post on this subject. “Early Fiat Money in China,” August 8, 2013. “Bitcoin is no Great Mystery,” April 6, 2013. “Steve Keen on the History of Money,” January 30, 2012. “Steve Keen on Endogenous Money,” June 18, 2012. “Steve Keen on the Myth of the Money Multiplier,” October 24, 2012. “Victoria Chick on Money,” August 26, 2013. “Randall Wray on Money and ‘Rethinking the State,’” November 2, 2013. “Steve Keen on Behavioral Finance, Lecture 8: Modeling Endogenous Money,” October 14, 2011. A very short interview here with Steve Keen posted on the “Economics in Debate” website. The following is an index to my posts on Post Keynesian economics, and is divided into thirty-one topic headings. “Top 30 Heterodox Keynesian/MMT Economics Blogs,” August 8, 2012. “Bibliography on Keynesian Uncertainty,” March 3, 2011. “Bibliography on George L. S. Shackle,” March 4, 2011. “Reading List for Post Keynesian Economics,” December 4, 2011. “Some Introductions to Keynes and Post Keynesian Thought,” October 16, 2012. “Bibliography on Debt Deflation,” October 16, 2012. “Bibliography on Methodological Individualism,” April 17, 2013. “Bibliography on Keynes’s Theory of Probability,” July 13, 2013. “Post Keynesian Economists: A List,” March 1, 2012. “King on Post Keynesian Approaches to Microfoundations,” April 1, 2013. “Greedy Reductionism, Science and Economics,” April 2, 2013. “Geoffrey Hodgson on the Mirage of Microfoundations,” April 4, 2013. “Neoclassical Synthesis Keynesianism, New Keynesianism and Post Keynesianism: A Review,” July 7, 2010. “Post Keynesians Reject the Liquidity Trap,” May 6, 2011. “Mark Hayes on Post Keynesian Economic Policies,” September 12, 2011. “Post Keynesian Economics: A Panel Discussion,” August 15, 2012. “The Essence of Keynesianism is Investment,” December 8, 2012. “Lerner on ‘The Burden of the National Debt,’” October 23, 2012. “World GDP versus Total Value of Financial Asset Market Exchanges,” February 21, 2013. “Capitalism has Two Fundamental Sectors,” February 22, 2013. “The Essence of Post Keynesian Theory of Unemployment,” May 16, 2013. “Kaldor on the Irrelevance of Equilibrium Economics,” May 15, 2013. “The Concept of ‘Animal Spirits’ is a Red Herring,” June 27, 2011. “Louis-Philippe Rochon on What Should Central Banks Do?,” January 31, 2012. “Post Keynesian Policy on Interest Rates,” March 12, 2013. “Keynes’s ‘Unemployment Equilibrium,’” July 9, 2011. “Keynes on the New Deal in 1933,” September 2, 2011. “Keynes’s Marginal Efficiency of Capital: A Mistake?,” January 1, 2012. “Keynes on the Nature of Deflation,” October 14, 2012. “Shackle on Keynes on Equilibrium,” October 11, 2012. “‘In the Long Run we are all Dead’: What Did Keynes Mean by That?,” May 5, 2013. “Keynes’s Mistakes in the General Theory,” May 7, 2013. “Keynes and Marginalism,” November 5, 2013. “John Maynard Keynes’s Early Years, 1883–1902: Some Trivia,” February 25, 2012. “Keynes’s Early Life, 1902–1909,” March 6, 2012. “Keynes’s Early Life, 1909–1914,” March 17, 2012. “Keynes’s Life, 1914–1920: WWI and its Aftermath,” April 22, 2012. “How Can Government Overcome Uncertainty?,” October 4, 2011. “Fisher on Debt Deflation,” October 26, 2012. “The Law of Demand in Neoclassical Economics,” June 1, 2013. “Steve Keen on the Law of Demand,” September 20, 2013. “Review of the Cambridge Capital Controversies,” March 2, 2012. “Steven Pressman on Public Choice Theory,” February 1, 2013. “Assorted Papers from Minsky on Credit, Banking and Finance,” April 6, 2012. “Was Hyman Minsky a Post Keynesian?,” April 6, 2012. “Would Keynes have endorsed Modern Monetary Theory/Neochartalism?,” September 23, 2010. “Bill Mitchell and Randy Wray on Modern Monetary Theory 1,” June 12, 2011. “Bill Mitchell and Randy Wray on Modern Monetary Theory 2,” June 12, 2011. “The History of Modern Monetary Theory,” January 3, 2012. “Some Serious Criticism of MMT,” July 2, 2012. “Scott Fullwiler on Modern Monetary Theory,” July 21, 2012. “MMT vs. the Austrian School Debate,” June 19, 2013. “MMT Conference Panel: Fiscal Austerity or Stimulus?,” December 16, 2011. “Stephanie Kelton on MMT,” October 13, 2011. “Bill Mitchell on MMT,” October 17, 2011. “Pavlina Tcherneva on an MMT Employment Program,” January 9, 2012. “Pavalina Tcherneva on MMT,” January 10, 2012. “Randall Wray on MMT and the US Economic Crisis,” May 24, 2012. “Paul Davidson Interview,” July 21, 2012. “Paul Davidson on Mercantilism,” July 21, 2012. “Paul Davidson on the Keynes Solution,” December 9, 2012. “Thomas Palley on the Disaster of Neoliberal Economics,” February 3, 2012. “Thomas Palley on the Structural Problems of Neoliberalism and the Eurozone,” January 1, 2012. “Interview with Thomas Palley,” April 24, 2012. “Interview with Geoffrey Harcourt,” February 25, 2012. “King’s Nicholas Kaldor: Chapters 1–3,” October 18, 2013. “Interview with Wynne Godley,” February 28, 2012. “Interview with G. L. S. Shackle,” August 2, 2011. “John King on Behavioural Economics,” September 5, 2013. “John King on Pluralism in Economics,” July 16, 2013. “Lars P. Syll on Probability and Economics,” July 7, 2013. “Steve Keen on Debt Deflation and Double Dip Recession,” June 14, 2011. “Steve Keen on Neoclassical Economics,” July 2, 2011. “Steve Keen on Finance Theory,” July 22, 2011. “Steve Keen on Behavioral Finance,” August 12, 2011. “Steve Keen on Behavioural Finance, Lecture 4,” August 24, 2011. “Steve Keen on Behavioral Finance, Lecture 6,” September 12, 2011. “Steve Keen on Behavioral Finance, Lecture 7,” September 18, 2011. “Steve Keen on Behavioral Finance, Lecture 9: Extending the Endogenous Money Model,” October 20, 2011. “Steve Keen at Oxford,” October 27, 2011. “Steve Keen on Behavioral Finance, Lecture 10,” October 31, 2011. “Steve Keen on Behavioral Finance, Lecture 11,” November 8, 2011. “Steve Keen Lecture at Cambridge,” November 26, 2011. “Steve Keen on Debunking Economics,” January 20, 2012. “Steve Keen, Google Talk,” February 16, 2012. “Steve Keen on Zombie Banks,” February 29, 2012. “Steve Keen on Advanced Political Economy 1,” March 15, 2012. “Steve Keen on Advanced Political Economy 2,” March 17, 2012. “Steve Keen on Neoclassical Economics and the Minsky Project,” March 30, 2012. “Steve Keen on Minsky and Instability in Financial Markets,” April 16, 2012. “Steve Keen on the Eurozone,” April 26, 2012. “Steve Keen on Banking,” May 3, 2012. “Steve Keen: Monetary Minsky Model,” June 25, 2012. “Steve Keen: Advanced Political Economy, Lecture 3,” June 25, 2012. “Steve Keen on the Canadian Housing Bubble,” July 1, 2012. “Steve Keen on Minsky,” July 6, 2012. “Steve Keen Interview on Understanding Economics,” July 16, 2012. “Steve Keen on Fixing the Economy Panel,” August 1, 2012. “Steve Keen Interview with Max Keiser,” August 31, 2012. “Steve Keen on Hyman Minsky,” September 8, 2012. “Steve Keen on Forecasting the Next Financial Crisis,” September 17, 2012. “Steve Keen at the American Monetary Institute Conference,” September 22, 2012. “Steve Keen Talks at the UMKC Post Keynesian Conference,” October 1, 2012. “Steve Keen Talk at Cambridge on Monetary Macroeconomics,” November 30, 2012. “Steve Keen on Debt in Neoclassical Economics,” December 3, 2012. “Steve Keen NICTA Talk on Minsky,” March 12, 2013. “Steve Keen on US Stock Market Bubble,” March 13, 2013. “Steve Keen on Private Debt and Neoclassical Economics,” May 22, 2013. “Steve Keen at the Harvard Law School,” June 6, 2013. “Steve Keen on Monetary Macroeconomics,” June 16, 2013. “Steve Keen Demonstrates Minsky Program,” June 22, 2013. “Steve Keen on Non-Equilibrium Economics: Lecture 1,” October 1, 2013. “Steve Keen on Non-Equilibrium Economics: Lecture 2,” October 2, 2013. “Steve Keen on Non-Equilibrium Economics: Lecture 3,” October 3, 2013. “Steve Keen on Non-Equilibrium Economics: Lecture 4,” October 4, 2013. “Steve Keen on Non-Equilibrium Economics: Lecture 5,” October 5, 2013. “Steve Keen Manchester Talk,” December 11, 2013. “Despite frequent assertions that Austrian economics is defined as ‘market process economics’ or ‘disequilibrium economics,’ the concept of equilibrium features prominently in causal-realist economics (Hülsmann, 2000; MacKenzie, 2008) At least four distinct equilibrium constructs appear in Austrian analysis. Following Mises’s terminology, as amended by Salerno (1994a), we can call them the plain state of rest (PSR), the fully arbitraged state of rest or Wicksteedian state of rest (WSR), the final state of rest (FSR), and the evenly rotating economy (ERE). Two of these, the PSR and WSR, describe real-world outcomes, while the FSR and ERE are what Mises called ‘imaginary constructions,’ hypothetical scenarios that do not obtain in reality, but are useful in economic reasoning, allowing the theorist to isolate the effects of particular actions or circumstances, holding all else constant.” (Klein 2010: 135). (4) the “evenly rotating economy” (ERE). (1), (3), and (4) were defined by Mises, and (2) developed subsequently by other Austrian economists. “People keep on exchanging on the market until no further exchange is possible because no party expects any further improvement of its own conditions from a new act of exchange. The potential buyers consider the prices asked by the potential sellers unsatisfactory, and vice versa. No more transactions take place. A state of rest emerges. This state of rest, which we may call the plain state of rest, is not an imaginary construction. It comes to pass again and again. When the stock market closes, the brokers have carried out all orders which could be executed at the market price. Only those potential sellers and buyers who consider the market price too low or too high respectively have not sold or bought.” (Mises 2008: 245). “The plain state of rest is not an imaginary construction; it happens whenever there are no transactions, because no buyer wishes to acquire more units of the good or service at the price necessary to induce a seller to surrender more units. The plain state of rest is only transitory; it will be disrupted whenever preferences change and mutually advantageous exchanges once again exist.” (Murphy and Gabriel 2008: 107). “Mises’s illustration … of the plain state of rest—namely, the daily close of a stock market—is rather unfortunate, for the market closes at a preordained time, and in principle there could be frustrated buyers and sellers who don’t exchange simply because of the closing bell. To make matters worse, Mises justifies his choice by pointing out (in footnote 9) that he is disregarding the fluctuations in stock prices over the course of the trading day. A better choice would have been a market in which prices remain fairly stable; then a period in which no sales took place (even though the market is ‘open’) would constitute a plain state of rest.” (Murphy and Gabriel 2008: 107). “The ‘supply and demand’ which are continually in equilibrium in Mises’s world, do not refer to the supply and demand schedules so basic to mainstream microeconomic theory. They refer simply to the circumstance that, in any situation, those potential transactors who have been aware of available mutually beneficial trade possibilities, will all certainly have moved to take advantage of these opportunities; once these opportunities have been grasped, market activity of course ceases, the plain state of rest has been attained. To describe the price emerging from these exchange transactions as a ‘market-clearing price’ (Salerno, 1993, p. 121), is therefore misleading. Certainly the price permits all those who stand to gain by exchanging at this price and who are aware of this—to exchange to the point where no known remaining mutually gainful opportunities exist. But the term ‘market-clearing price’ (a term not used by Mises) is used in standard economics to refer to the exhaustion of all mutually gainful exchange opportunities under the hypothetical conditions of (relevant) omniscience. Standard economics indeed notoriously proceeds, in applying supply and demand theory to the real world, to operate as if conditions of relevant omniscience can be taken as given. Mises is certainly not making any such assumption of omniscience. His market prices are certainly not ‘market clearing prices’ (in the usual sense of that term). There is, one is able to reassure the puzzled reader, therefore no contradiction in his exposition. Real world market prices are not the equilibrium prices of standard economic theory. (Real world prices relate to equilibrium only in a very narrow sense, a sense to which no attention at all is given in standard theory.) Real world prices are indeed likely to be ‘false’ prices, setting off entrepreneurial-competitive activity modifying the pattern of resource allocation.” (Kirzner 2000: 167–168). There is a sense in which an individual “plain state of rest” per se is a trivial notion of equilibrium as described here by Kirzner, which is different from and opposed to the alternative idea of equilibrium as one of supply and demand in a product market. But, despite Kirzner, Mises does have a clear belief in the tendency of free markets to produce supply and demand equilibrium via flexible prices (as we will see below). “prices ... are generated by the market process and serve as the data for economic calculation. These are realized prices; or, in other words, they are the actual outcome of the historical market process at each moment in time and are determined by the value scales of the marginal pairs in each market. They are, therefore, also market-clearing prices the establishment of which coincides with a momentary situation, what Mises calls the ‘plain state of rest’ (PSR), in which no market participant, given his existing marginal-utility rankings of goods and money and knowledge of prevailing prices, can enhance his welfare by participating in further exchange. However, despite their character as market-clearing prices, these are also disequilibrium prices. Thus as a consequence of the unavoidable errors of entrepreneurial forecasting and price appraisement under uncertainty, most goods are sold at prices that do not conform to their monetary costs of production, thereby generating realized profits and losses for producers.” (Salerno 1990: 121; cf. Salerno 2010: 141). So prices are “disequilibrium prices” in the sense that they are not equal to marginal costs of production, but allow profit and loss. Kirzner criticises Salerno’s use of the term “market-clearing price” in the context of an individual “plain state of rest” since this is unlikely to be a true market-clearing price in the sense of a supply and demand equilibrium in a product market. But if “plain state of rest” prices are construed as “market-clearing prices” over time in a sequence as prices are adjusted toward the price at which there is supply and demand equilibrium, then Salerno’s use of the term “market-clearing price” is justifiable. “Mises conceives the market process as coordinative, ‘the essence of coordination of all elements of supply and demand.’ This means that the structure of realized (disequilibrium) prices, which continually emerges in the course of the market process and whose elements are employed for monetary calculation, performs the indispensable function of clearing all markets and, in the process, coordinating the productive employments and combinations of all resources with one another and with the anticipated preferences of consumers.” (Salerno 1993: 124). “Lying between the … [sc. plain state of rest] and the … [sc. final state of rest] is the WSR [sc. Wicksteedian state of rest], a realistic concept in which trading takes place while preferences remain constant, with market participants revising their beliefs about other participants’ reservation prices until all feasible gains from trade are exhausted. Wicksteed’s (1910, pp. 219–28) fruit market provides the canonical example. By the end of each market day, a specified period in which preferences, stocks of goods, and the set of traders remains fixed, what Wicksteed calls ‘the equilibrating price’ has been achieved. In this situation, ‘the marginal position of the commodity in question is identical upon the relative scales of all who have secured a supply, and higher on them all than it is on the scales of any of those who have secured no supply’ (Wicksteed, 1910, p. 216). The market day is a hypothetical construct, in that it holds only as long as preferences, technical knowledge, stocks of goods available for exchange, and so on are held constant. And yet, the WSR is not a purely imaginary construction, as this process of equilibration takes place in real markets, at least over short periods of calendar time.” (Klein 2010: 138). The “Wicksteedian state of rest” thus appears to be a supply and demand equilibrium in an individual product market. “But now we go a step further. We pay attention to factors which are bound to bring about a tendency toward price changes. We try to find out to what goal this tendency must lead before all its driving force is exhausted and a new state of rest emerges. The price corresponding to this future state of rest was called the natural price by older economists; nowadays the term static price is often used. In order to avoid misleading associations it is more expedient to call it the final price and accordingly to speak of the final state of rest. This final state of rest is an imaginary construction, not a description of reality. For the final state of rest will never be attained. New disturbing factors will emerge before it will be realized. What makes it necessary to take recourse to this imaginary construction is the fact that the market at every instant is moving toward a final state of rest. Every later new instant can create new facts altering this final state of rest. But the market is always disquieted by a striving after a definite final state of rest.” (Mises 2008: 246). A “final state of rest” price is a market clearing price and (apparently) a price equal to marginal cost. But there is some ambiguity here: is the “final state of rest” a situation where all prices in all product markets have reached their market-clearing and equilibrium values? Or it is only meant to refer to an individual product market? “The second equilibrium notion Mises employs is the ‘final state of rest,’ the state toward which the market tends if there is no change in the data. This apparently is Mises’ analogue to general equilibrium. Whereas the plan state of rest is a phenomenon that is routinely found in markets, the final state of rest is an ‘imaginary construction’ in that it can never be achieved in reality, although it is a necessary analytic tool for understanding the direction of price changes.” (Vaughn 1994: 81–82). “the final state of rest is indeed an imaginary construction. It refers to the situation in which all of the effects of a particular disturbance have run their course, and the price in question has reached its final price. If a new report causes half of the smokers to quit cold turkey, a plain state of rest in the cigarette market will soon emerge at a much lower price. However, as cigarette manufacturers scale back their operations and the glut of inventory is reduced to the new level (appropriate for the cut in customers), a new final price will emerge (that may be higher or lower than the previous final price, depending on the specifics). (Murphy and Gabriel 2008: 107–108). Despite this, the “final state of rest” involves market clearing prices in the sense of supply and demand equilibrium. “The imaginary construction of the final state of rest is marked by paying full regard to change in the temporal succession of events. In this respect it differs from the imaginary construction of the evenly rotating economy which is characterized by the elimination of change in the data and of the time element. (It is inexpedient and misleading to call this imaginary construction, as is usual, the static economy or the static equilibrium, and it is a bad mistake to confuse it with the imaginary construction of a stationary economy.) The evenly rotating economy is a fictitious system in which the market prices of all goods and services coincide with the final prices. There are in its frame no price changes whatever; there is perfect price stability. The same market transactions are repeated again and again. The goods of the higher orders pass in the same quantities through the same stages of processing until ultimately the produced consumers' goods come into the hands of the consumers and are consumed. No changes in the market data occur. Today does not differ from yesterday and tomorrow will not differ from today. The system is in perpetual flux, but it remains always at the same spot. It revolves evenly round a fixed center, it rotates evenly. The plain state of rest is disarranged again and again, but it is instantly reestablished at the previous level. All factors, including those bringing about the recurring disarrangement of the plain state of rest, are constant. Therefore prices—commonly called static or equilibrium prices—remain constant too.” (Mises 2008: 247–248). We further read that it is a state where there is no profit and loss (Mises 2008: 249) and where there is no uncertainty whatsoever about the future, and nobody holds cash for precautionary motives (Mises 2008: 250). The evenly rotating economy, then, is a purely “imaginary construction” (Mises 2008: 247) and real world market economies do not have a tendency towards it. So it need not detain us. Despite constant changes in the data and disequilibrating phenomena, nevertheless for Mises the market economy is constantly tending towards new “final states of rest” (in which values have changed owing to changes in current market data). But this seems like a rather weak notion of equilibrium. If an economy does not ever attain a long-run convergence to a particular “final state of rest,” but consists of multiple short-period convergences to one “final state of rest” quickly thwarted as the economy must adjust to a new convergence to yet another new “final state of rest,” then it is difficult to see why Mises can declare that markets have any strong or effective long-run self-equilibration. What, then, is Mises left with, if he wants to argue that market economies have a strong tendency to equilibration? That is to say, prices and wages are flexible and determined by supply and demand in trades between buyers and sellers. Increased demand drives prices upwards, and decreased demand drives prices downwards. Demand curves are well behaved and each product market has a market-clearing price that would equate quantity demanded by buyers with quantity supplied by sellers to eliminate surplus or shortages of goods. This demand and supply equilibrium tendency is also held to include the market for loanable funds, so that saving and investment are supposed to be coordinated by a market clearing interest rate. (2) the entrepreneurial pursuit of profit, which has a tendency to drive profits towards zero as firms and businesses compete against each other by noticing profit differences, and by moving in and out of markets to exploit high profits. Factor (1) above is fundamentally important. (1) “The price structure of the market decides what will be produced, how, and in what quantity. Through the structure of prices, wages, and interest rates the market brings supply and demand into balance and sees to it that each branch of production will be as fully occupied as corresponds to the volume and intensity of the effective demand. Thus capitalist production derives its meaning from the market. Of course, a temporary imbalance between production and demand can occur, but the structure of market prices makes sure that the balance is reestablished in a short time. Only when the mechanism of the market is disturbed by external interventions is the effect of market prices on the regulation of production prevented; they are disturbances that no longer can be remedied by the automatic reactions of the market, disturbance that are not temporary but prolonged.” (Mises 2002a : 170). (2) “Entrepreneurs try to supply those goods whose sale promises them the highest possible profit. But it is the market that decides where profits are earned and losses suffered. If consumers demand more of a product, then its price rises; if they demand less, then the price falls. If entrepreneurs produce only those goods whose sale promises to bring them profits, then that means they are following the wishes of the consumers. It is the market, therefore, that directs a capitalist economy, based on the private ownership of the means of production. The changing prices of the market bring supply and demand into equilibrium. The market price—called the ‘natural price’ by the Classical economists and the ‘static price’ by modern economists—finds its level at a point at which no prospective buyer who is ready to pay the market price leaves the market unsatisfied, and no prospective seller who is willing to accept the market price leaves the market with unsold goods.” (Mises 2002b : 209). (3) “Price control measures paralyze the working of the market. They destroy the market. They deprive the market economy of its steering power and render it unworkable. The price structure of the market is characterized by its tendency to bring supply and demand into balance. If the authority attempts to fix a price different from the market price, this situation cannot prevail. In the case of maximum prices, there are potential buyers who cannot buy although they are ready to pay the price fixed by the authority, or even to pay a higher price. Or there are—in the case of minimum prices—potential sellers who cannot find buyers even though they are willing to sell at the price established by the authority, or even to sell at a lower price. The price is no longer the means of segregating those potential buyers and sellers who may buy or sell from those who may not. A different principle of selection has to come into operation. It may be that only those who come first or those who occupy a privileged position due to particular circumstances (personal connections, for instance) will actually buy or sell. But it may also be that the authority itself takes over the regulation of distribution. At any rate the market is no longer able to provide for the distribution of the available supply to the consumers. If chaotic conditions are to be avoided, and if neither chance nor force is to be relied upon to determine distribution, the authority has to undertake this task by some system of rationing.” (Mises 1998 : 26). (4) “The aim of price control is to decree prices, wages, and interest rates different from those fixed by the market. Let us first consider the case of maximum prices, where the government tries to enforce prices lower than the market prices. The prices set on the unhampered market correspond to an equilibrium of demand and supply. Everybody who is ready to pay the market price can buy as much as he wants to buy. Everybody who is ready to sell at the market price can sell as much as he wants to sell. If the government, without a corresponding increase in the quantity of goods available for sale, decrees that buying and selling must be done at a lower price, and thus makes it illegal either to ask or to pay the potential market price, then this equilibrium can no longer prevail. With unchanged supply there are now more potential buyers on the market, namely, those who could not afford the higher market price but are prepared to buy at the lower official rate. There are now potential buyers who cannot buy, although they are ready to pay the price fixed by the government or even a higher price.” (Mises 2010 : 61). (5) “The crisis from which the world is suffering today is the crisis of interventionism and of national and municipal socialism; in short, it is the crisis of anticapitalist policies. Capitalist society—there is no difference of opinion about this—is governed by the workings of the market process. Market prices bring supply and demand into balance and determine the direction and extent of production. The capitalist economy gets its meaning from the market. If the function of the market as regulator of production is permanently undermined by an economic policy that attempts to set prices, wages, and interest rates other than in the way the market forms them, then a crisis will surely occur.” (Mises 2002c : 191). (6) “The characteristic feature of the market price is that it equalizes supply and demand. The size of the demand coincides with the size of supply not only in the imaginary construction of the evenly rotating economy. The notion of the plain state of rest as developed by the elementary theory of prices is a faithful description of what comes to pass in the market at every instant. Any deviation of a market price from the height at which supply and demand are equal is – in the unhampered market – self-liquidating.” (Mises 2008: 756–757). So, in the view of Mises, the tendency of either the unhampered market or a real world market towards any “final state of rest” depends fundamentally on a flexible price and wage system that coordinates quantity demanded with quantity supplied in product markets and the labour market. The action of entrepreneurs who pursue profits is the second most important coordinating mechanism, which (allegedly) causes a tendency for profits to be driven towards zero. Since neither element is in fact a strong characteristic of modern real world market economies, it follows that the Austrian view of market equilibration is false. Ebeling, Richard M. (ed.). 2002. Selected Writings of Ludwig von Mises: Between the Two World Wars: Monetary Disorder, Interventionism, Socialism, and the Great Depression (vol. 2). Liberty Fund, Indianapolis, Ind. Kirzner, Israel M. 2000. The Driving Force of the Market: Essays in Austrian Economics. Routledge, London and New York. Klein, Peter G. 2010. The Capitalist & the Entrepreneur: Essays on Organizations & Markets. Ludwig von Mises Institute, Auburn, Ala.
Mises, L. von. 1998 . Interventionism: An Economic Analysis. The Foundation for Economic Education, Irvington on Hudson, NY. Mises, L. von. 2002a . “The Economic Crisis and Capitalism,” in Richard M. Ebeling (ed. ), Selected Writings of Ludwig von Mises: Between the Two World Wars: Monetary Disorder, Interventionism, Socialism, and the Great Depression (vol. 2). Liberty Fund, Indianapolis, Ind. 169–173. Mises, L. von. 2002b . “Planned Economy and Socialism,” in Richard M. Ebeling (ed. ), Selected Writings of Ludwig von Mises: Between the Two World Wars: Monetary Disorder, Interventionism, Socialism, and the Great Depression (vol. 2). Liberty Fund, Indianapolis, Ind. 208–212. Mises, L. von. 2002c . “The Myth of the Failure of Capitalism,” in Richard M. Ebeling (ed. ), Selected Writings of Ludwig von Mises: Between the Two World Wars: Monetary Disorder, Interventionism, Socialism, and the Great Depression (vol. 2). Liberty Fund, Indianapolis, Ind. 182–191. Mises, L. von. 2010 . Omnipotent Government: The Rise of the Total State and Total War. Ludwig von Mises Institute, Auburn, Ala.
Murphy, Robert P. and Amadeus Gabriel. 2008. Study Guide to Human Action. A Treatise on Economics: Scholar’s Edition. Ludwig von Mises Institute, Auburn, Ala.
Salerno, Joseph T. 1990. “Ludwig von Mises as Social Rationalist,” Review of Austrian Economics 4: 26–54. Salerno, Joseph T. 1993. “Mises and Hayek Dehomogenized,” Review of Austrian Economics 6.2: 113–146. Salerno, Joseph T. 1994. “Ludwig von Mises’s Monetary Theory in Light of Modern Monetary Thought,” Review of Austrian Economics 8.1: 71–115. Carl Menger’s price theory can be read in an English translation in Principles of Economics (2011 [1st edn. 1871]; Eastbourne, UK), pp. 191–225. But a debate has raged about whether Menger had a clear notion of economic equilibrium and tendencies to equilibrium (Tieben 2012: 315). Some few have that held that Menger had some notion of supply and demand equilibrium via price coordination (Moss 1978), but most argue that Menger did not have any such theory (Streissler 1972, Kirzner 1978; Endres 1995). Indeed, even Hayek remarked on “the absence in Menger’s work of the conception of a general equilibrium” (Hayek 1992: 104). So, fundamentally, compared to both modern neoclassical and modern Austrian price theory, Menger’s price theory appears undeveloped (and it is also different from Marshallian partial equilibrium analysis). “[sc. Menger] … rejected the static notion of economic equilibrium – the equality between quantities supplied and demanded – as a starting point for theoretical analysis. But also as a dynamic conception there was no role for the conception of economic equilibrium in Menger’s theory of prices. Menger addressed the relationship between competition and prices as a secular trend, but there is hardly any reference in his theory of price to the capacity of competitive markets to establish equilibrium between supply and demand. Surprisingly, Menger never stressed the capacity of the market process to safeguard the relative harmony of the exchange mechanism, a function that is usually associated with the tendency of prices to move towards a supply and demand equilibrium.” (Tieben 2012: 319). Furthermore, Menger’s own analysis of multilateral exchange shows that negotiated prices can cause excess demand to persist (Tieben 2012: 322) – which is contrary to modern price theory in which flexible prices cause equilibration of supply and demand. Moss argues that Menger thought of true “equilibrium prices” as the price that emerges when completely determined by the preferences of economic agents and not influenced by their relative bargaining strengths (Moss 1978: 28; Tieben 2012: 320) – a definition contrary to the usual idea of an “equilibrium price” as a price that equates quantity demanded with total quantity supplied for sale. Arguably, it was Eugen von Böhm-Bawerk who extended Menger’s price theory to stress the idea of demand and supply equilibrium in prices (a concept which was called Gleichgewicht in German), and the (alleged) tendency of the market process via price formation to equilibrate demand and supply in auction-like markets (Endres 1996: 96; Tieben 2012: 323), even if Böhm-Bawerk’s view is that market clearing in this sense occurs in a given range of possible equilibrium prices rather than a unique Walrasian point price (Endres 1996: 96). This concept of market clearing is central to modern Austrian economics: it cannot be stressed how dependent modern Austrian theory is on this idea. Without a tendency towards demand and supply equilibrium via flexible prices, so much of Austrian economics – such as the belief in rapid and smooth recovery from recessions and Misesian economic coordination – is undermined and left without foundation. But it is strange indeed that Menger – the founder of Austrian theory – did not conceive of the price system as equilibrating supply and demand. Endres, A. M. 1995. “Carl Menger’s Theory of Price Formation Reconsidered,” History of Political Economy 27.2: 261–287. Endres, A. M. 1996. “Some Microfoundations of Austrian Economics: Böhm-Bawerk’s Version,” European Journal of the History of Economic Thought 3.1: 84–106. Endres, Anthony. 1997. Neoclassical Microeconomic Theory: The Founding Austrian Vision. Routledge, London. 60–84. Hayek, Friedrich A. von. 1992. “Carl Menger (1840–1921),” in P. G. Klein (ed. ), The Collected Works of F. A. Hayek. Volume IV. The Fortunes of Liberalism: Essays on Austrian Economics and the Ideal of Freedom. University of Chicago Press, Chicago. 61–107. Jaffé, William. 1976. “Menger, Jevons and Walras De-homogenized,” Economic Inquiry 14: 511–524. Kirzner, I. 1978. “The Entrepreneurial Role in Menger’s System,” Atlantic Economic Journal 6.3: 31–45. Menger, C. 2011. Principles of Economics (trans. Grundsätze der Volkswirtschaftslehre [1st edn. 1871] by J. Dingwall and B. F. Hoselitz), Terra Libertas, Eastbourne, UK. pp. 191–225. Moss, L. S. 1978. “Carl Menger’s Theory of Exchange,” Atlantic Economic Journal 6: 17–29. Streissler, Erich. 1972. “To What Extent was the Austrian School Marginalist?,” History of Political Economy 4.2: 426–461. Streissler, Erich. 1973. “Menger’s Theories of Money and Uncertainty—A Modern Interpretation,” in J. R. Hicks and W. Weber (eds. ), Carl Menger and the Austrian School of Economics. Clarendon Press, Oxford. 164–189. Streissler, Erich. 1990. “The Influence of German Economics on the Work of Menger and Marshall,” in Bruce J. Caldwell (ed. ), Carl Menger and His Legacy in Economics. Duke University Press, Durham. Tieben, Bert. 2012. The Concept of Equilibrium in Different Economic Traditions: An Historical Investigation. Edward Elgar, Cheltenham, UK and Northampton, MA. pp. 315–319. Tomo, S. 1987. Early Lectures on Economics by Böhm-Bawerk. Series no. 13, Centre for Historical Social Science Literature, Hitotsubashi University.